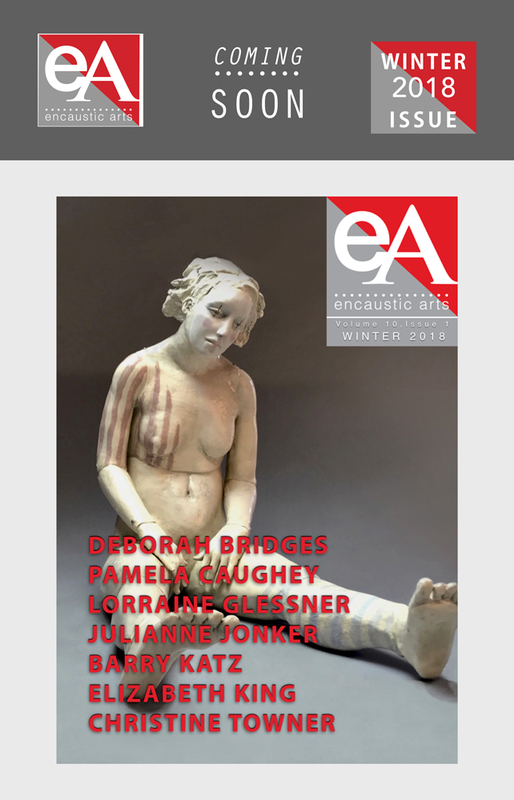 The Winter 2018 Issue of Encaustic Arts Magazine - AVAILABLE Dec 1st. Preview link to subscribe will be posted here on Dec 1. The Winter 2018 Issue of Encaustic Arts Magazine will be available on December 1st, 2018. This issue features the work of DEBORAH BRIDGES, PAMELA CAUGHEY, JULIANNE JONKER, BARRY KATZ, ELIZABETH KING, CHRISTINE TOWNER with a special technique feature by LORRAINE GLESSNER. The preview link to subscribe and read this issue will be posted to the main magazine page of the EAI website, on December 1. Encaustic Arts Magazine, the recipient of the 2016 La Vendéenne Award presented by International Encaustic Artists (IEA) for outstanding contributions to the advancement and practice of encaustic art in the Media category is published semi-annually, on December 1st and June 1st. The first and only international magazine about encaustic, it features the most important news about the medium, with information on techniques, tools, materials, and exhibitions. It is available as a digital/online magazine and is a full-color, full-length magazine. Explore how the wax medium is being used both traditionally and innovatively by artists around the world. View beautiful full-color photos of work by prominent as well as emerging artists. For more information about Encaustic Arts Magazine, click here. To read previous issues of the magazine, including free back issues (the Premier Edition through the Spring 2016 issues), click here. If you’d like to place an ad in this issue of the magazine, the deadline is November 5. Click here for rates and specs, or contact Douglas Mehrens for additional information. Cover art, (above): Deborah Bridges, Blanca, ceramic with encaustic finish, 12 x 16 x 8 inches, 2018. Courtesy of the artist.